A payment gateway is a service that processes card payments for online businesses like an online card terminal. A payment gateway is essential for businesses that accept payments online. Without one, you would have to manually process all payments over the phone or in person. Importantly, all payment gateways will charge a fee or a percentage of the transaction.</p? 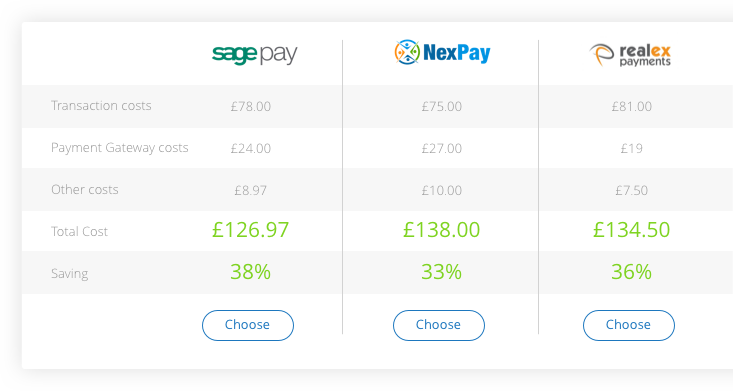 We work in partnership with a range of payment gateways on the market. After you tell us a little about your business, we generate quotes from each of our providers showing payment gateway costs and all other costs such as card processing fees. It only takes two minutes and can save you a lot of money. Showing you how selecting the right supplier can save you thousands of pounds every single year.